Dublin City, being the capital, tends to be the big Irish beneficiary of multinational companies looking to expand overseas. However, there is also a healthy interest in regional locations in Ireland. We have previously written about business investment by overseas companies in locations such as Kerry, Cork, Clare and Laois to name but a few. In August it was announced that Sigmar, the European recruitment company is adding to the number of international companies expanding in Ireland. The recruiter announced the creation of 50 jobs in Tralee, Co. Kerry that will form the company’s European Talent Hub. They are looking not just to hire but to develop talent to become successful international recruitment specialists. Many high-profile companies like Google, PayPal, eBay, Microsoft and LinkedIn already have their European Headquarters in Ireland, Sigmar is now set to do likewise. 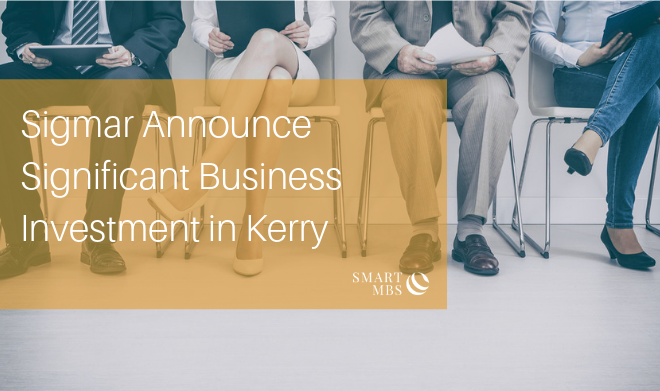 The Sigmar office in Kerry will be responsible for placing IT professionals across European markets with candidates looking for international experience from overseas countries. Sigmar also announced a strategic partnership earlier in 2018 with the French recruitment company, Groupe Adéquat. The Tralee office will be the partnership’s first significant investment as a joint venture. “Ireland has the talent to capitalise on current international recruitment opportunities. This investment will kick-start the group’s international growth initially in Germany, then other parts of Europe and the US. Sigmar has been very supportive of regional development and this investment proves our belief in the business case for regionalisation. Kerry is home to several global operations such as BorgWarner, Liebherr, Starwood Hotels and of course the Irish food conglomerate, Kerry Group. Astellas is one of the largest pharmaceutical companies in the world and has had a presence in Killorglin since 1990. They currently employ over 300 people manufacturing products for global markets. Another Irish success story, Fexco was founded in 1981 and headquartered in Kerry since 1982. A global leader specialising in payments solutions for businesses, they boast operations in 29 countries around the globe. Set up in 2011, JRI America provide IT services for the Japanese multinational Sumitomo Mitsui Financial Group. They employ 70 people at the 14,000 metres squared facility in Kerry, as part of a global IT delivery team. Deep in the Southwest of Ireland, it may appear like the county is far removed from the hustle and bustle of Dublin. However, there are three airports with 77 scheduled services across 14 air carriers within under two hours’ drive. Are you considering a business investment for your company? Why not have a look at our articles on the 5 most common questions on Incorporating a company in Ireland and why Ireland is a good choice for international companies. If you’d like some further information, please complete the form below. We will have one of our consultants contact you.